The perfection loop gives any lure the freedom of movement as compared to any other knot that draws down tight on the eye. This knot allows better action from the lure and a makes for a more natural presentation. I use this knot mainly on crank baits, stick baits and jerk baits. It really does improve the action of your lures. This more natural action is sometimes the key to getting more bites! 1. Tie a loose overhand knot on the end of your line leaving a few inches on the tag end. 2. Pull the tag end through the eye of your lure. 3. Thread the tag end back through the over hand knot. 4. 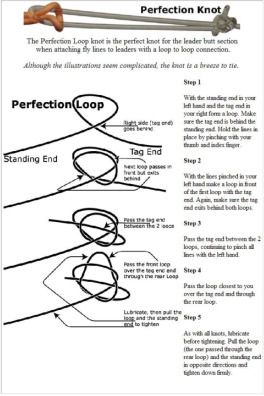 The tag end must bend back, go over the main line, up through the crossover forming the underhand knot, then up through the gap between where the tag was passed through the knot in step 3. 5. Tighten the knot by pulling on the loop against the main line.